I had just attended a Healthy Cooking Class, taught by Christina Bata, RDN,LRD at First Care Health Center in Park River, ND. One of the item she demonstrated was, The Best Energy Bites. 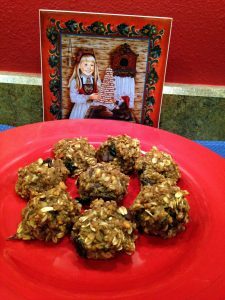 They were very similar to the Protein Balls that I usually make, but had just a few minor differences. They were delicious, and I was eager to try them out. I had all of the ingredients in my kitchen, so I didn’t even have to run to the store. Sunday afternoon found me in my kitchen, assembling the Energy Bites. In less than 15 minutes, they were ready, I placed them in the refrigerator to become firm. To the delight of my co-workers, I brought my freshly made Best Energy Bites, and the recipe to work on Monday. Within a few hours they were gone! I received rave reviews! Jen brought some home, and received “thumbs up” from her husband and two year old daughter. As a nurse, I must point that these Best Energy Bites are a good source of protein, fiber and Omega’3’s. If constipation is a problem in your life, eating a couple of these every day could be an amazing and delicious solution.